Sydney Modern Quilt Guild has two meetings per month. A full day of sewing happens on our Sewing Sundays from 10am-4pm, but what goes on at Monday MeetUp you ask? We meet at the same club, Dooleys Waterview Club and have a table booked from 7pm. There is the opportunity to have dinner, or just cake and coffee or tea, as people make their way in for a 7.30 start. There is always plenty of conversation, laughter and handsewing. Generally there is a topic for discussion. You can sit and listen, or jump in with your own tidbits. 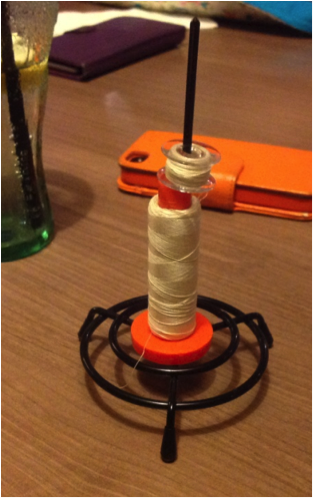 The March Monday MeetUp topic was your “Favourite quilting tools or gadgets”. There were many ideas that were shared including some novel uses for objects unrelated to the usual quilting notions. 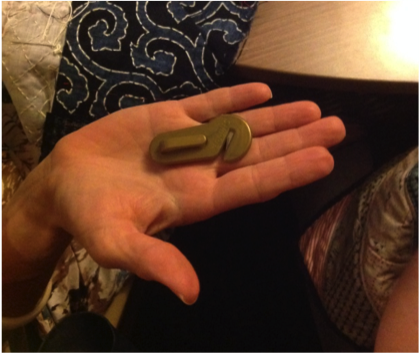 This ingenious little device was shown to us by Jodi – a first time visitor. It’s a “snippit” a gadget from Canada for opening plastic milk pouches. The cleverly concealed blade is perfect for snipping threads and can safely be taken on flights. It’s also magnetic…which means it’s a needle holder too! Our next Monday MeetUp is on 24 April from 7pm at Dooley Waterview Club Silverwater Road Silverwater. Contact details are on our Facebook page, instagram or by email from our blog. We look forward to seeing our regulars and new comers in the coming months.